Get all of your Amazon purchases for free. Here are 11 ways you can earn free Amazon gift cards. Earn points that you can redeem for Amazon gift cards by using Bing as your search engine. Just sign up for Bing Rewards, and it'll automatically add points to your account each time you do a search. To earn points faster, do your Bing searches using the Microsoft Edge browser. This is a tiered program, so you'll earn more points when you move up to the next level. This rewards program is available for ages 13 and up, so, your kids can do it, too! Shop through TopCashback whenever you make an online purchase, and earn cashback. They're guaranteed to have the highest cashback offer of anyone, so you don't have to waste your time checking a bunch of sites before you shop, and if you choose an Amazon gift card for your payout, they'll give you an extra three percent! Better still: there's no minimum threshold that you have to meet before you can cash out. Request a gift card whenever you want one. To earn gift cards faster, be sure to take advantage of special offers. They sometimes offer as much as 100 percent back on certain items. Sign up for Amazon's Mechanical Turk, and get paid to complete simple tasks, like checking for typos, tagging images or transcribing data. You can have your earnings deposited into a U.S. bank account or converted to an Amazon gift card. Tip: Sort HITs (that's what they call all the available jobs), so that the highest paying gigs are shown first. Set aside some time each week to fill out online surveys, and earn Amazon gift cards for your time. Some big-name survey sites that offer Amazon cards: Harris Poll, Opinion Outpost SurveySpot and Toluna. For a current list of all the legitimate survey sites that offer Amazon gift cards as a reward, visit Survey Police. Screenshot of Mypoints.com - June 2014. Earn MyPoints for reading e-mails, shopping, taking surveys, printing coupons, watching videos and completing a variety of other activities. Then, cash in your points for Amazon gift cards. They currently offer $10, $25 and $50 cards. Tip: Save up your points until you have enough for a $25 or $50 card. They're a better deal. Earn Swag Bucks for doing web searches, watching videos, shopping, finding Swag Codes, playing games and more. Then, cash in your Swag Bucks for Amazon gift cards. They currently offer $5, $10, $25 and $50 denominations. Keep an eye out for free gift card promotions on Amazon. They frequently offer "spend $50, get a $25 gift card" offers in the "Grocery" and "Health and Personal Care" categories. It only takes a minute to check, so get in the habit of looking whenever you're on the site. If you're good about paying off your credit card each month, check out the Amazon.com Visa card. You'll earn three points for every dollar that you spend on Amazon, $2 for every dollar that you spend at gas stations, restaurants and drug stores, and $1 for every dollar that you spend elsewhere. 2,500 points is enough for a $25 Amazon gift card. Not in the market for another card? 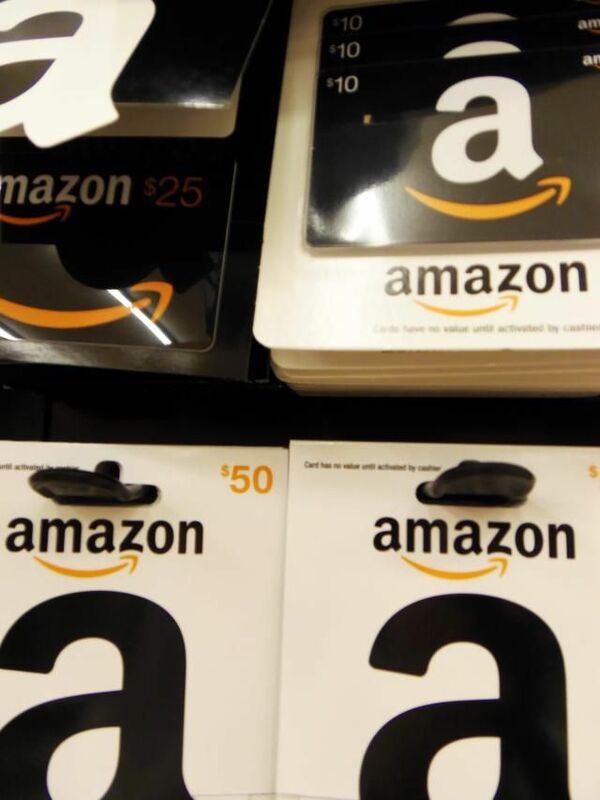 Most credit cards offer Amazon gift cards as a reward. Check the rewards catalog to see if any of yours do. If you have a Chase card, you can connect your card to your Amazon account to spend your accumulated points any time you want. There's no threshold you have to meet first. Download the Ibotta app to earn cash back when you buy featured grocery items (things like milk, eggs and bananas). Then, cash in your earnings for an Amazon gift card. Use the Shopkick app to check for deals before you head to the grocery store. Then, earn points for walking into a store, scanning specific products, making purchases and scanning your receipts. Convert your points into Amazon gift cards. Gather up all those old cell phones, laptops, digital cameras, video games, movies, books (including textbooks) and electronic gadgets that are taking up space in your house, and trade them in for Amazon gift cards. The Amazon Trade-In Program makes it easy to see how much your stuff is worth, and just as easy to send it in. And they're usually willing to pay more than anyone else. Use sellcell.com, bookscouter.com and DirectTextbook.com to see how much other companies are paying before you complete the deal.